A few years from now, climate change has produced global drought. 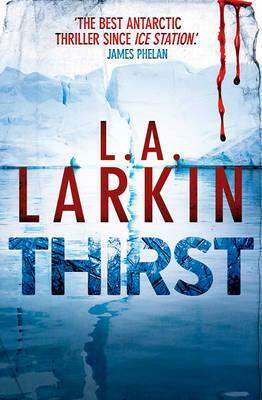 Wars over water are becoming commonplace.When communications are cut from an Australian Antarctic station and two colleagues go missing, maverick glaciologist Luke Searle and his team are unaware they have fallen victim to a plan to harvest Antarctica’s Pine Island Glacier for water. Yet the ruthless leader of this secret project has a second plan, far more ambitious and destructive than the first, which will give his country unchallengeable military power and make him exceedingly rich. But the plan risks destroying the enormous West Antarctic Ice Sheet, causing sea level rises that will not only wipe out low-lying cities, but whole countries. A great read!! Suspenseful! Fast paced!! Action packed!! Beautiful scenery!! Well written characters!! Thirst is set in Antarctica and shines a light on one of the biggest environmental issues of today. When Australian glaciologist, Luke Searle, finds out what the bad guys are up, its up to his team to save the world in 5 days. This book was a little different to what we have been reading, and a book that some our readers would not have chosen. However, we all thoroughly enjoyed it!! Its fast paced, pulling you in right from the beginning. We would definitely recommend this book. This entry was posted in Book Club Kits, Book Reviews, Fiction and tagged Antarctica, eco read, thriller by Parra Reader. Bookmark the permalink.